My understanding of the conflict in Israel and pro-Israel advocacy efforts was, for a while, largely limited by my own ignorance. For the early half of my life, I was focused strictly on my education, both secular and Judaic, and less on exploring the intricacies of the conflict, Israel’s history, or pro-Israel advocacy platforms. My extended family had been living in Israel ever since my uncle and aunt had married and I traveled there often to visit. Yet, the only connection that I felt with Israel at the time stemmed from my Jewish private school education. I prayed facing Jerusalem, celebrated Jewish holidays, and participated in Holocaust Remembrance, Independence Day, and Yom Hazikaron commemoration ceremonies. After my transition into public high school, I quickly became the Israeli Club president. However, I still did not go out of my way to explore pro-Israel outlets, nor did I anticipate the direction of my education to have taken me to where I find myself currently. It wasn’t until my year in seminary that I truly began to comprehend the importance of educating oneself on matters of one’s faith and conviction. One of my roommates in seminary was Israeli. Luckily, she had family in Israel by whom we would spend most weekends of our year. It was with her second cousins that we spent our first Shabbat in Israel. I had not even stepped through the door before being lovingly embraced by the mother and daughter. We entered their home and immediately I noticed the large, realistic, painting of a boy smiling softly mounted above their Shabbat candlesticks. Brush strokes that portrayed the youth and vibrancy of this young man, with a passion and love for life in his eyes. Instantly, I knew. Later I would learn the life story of their 19-year-old son who was fatally shot while patrolling the Old City’s Lions Gate in July of 2008. So as I stood in silence, later that year, while the “Red Alert” siren pierced the skies across the country, I suddenly felt the reality of the ultimate sacrifice that many made and continue to make to defend our homeland and our history. Throughout my year, an educator from Jerusalem University would come in monthly to teach us about Israel advocacy on college campuses. The course was designed to help prepare us for potential anti-Israel and anti-Semitic encounters at the universities we planned to attend the following year. Upon arriving on campus, I remained hesitant, at first, to get involved, intimidated by the students with advanced backgrounds in pro-Israel efforts. Realizing that everyone has to start somewhere, I finally took a chance and attended the StandWithUs In Focus International Conference this past January. For three days, I transitioned from speaker to speaker, in and out of intimate discussions and panels of individuals, each with their own dynamic story to share. 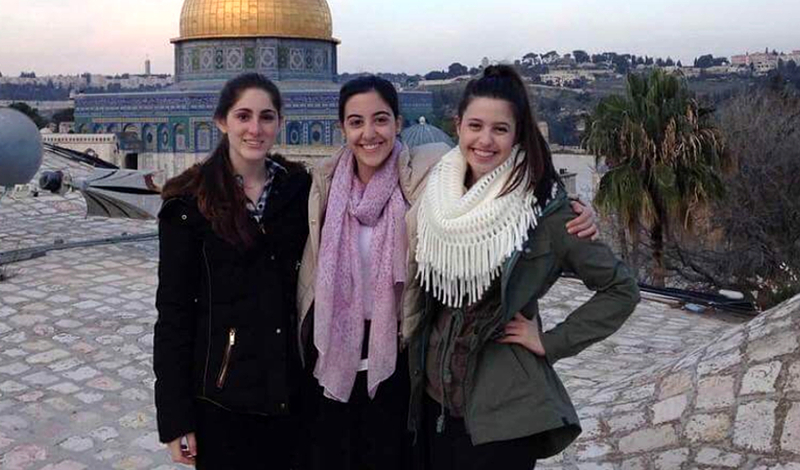 I found myself surrounded by students and leaders of all different backgrounds, beliefs, and philosophies — all with the same innate desire to further their Israel education and develop pro-Israel sentiment wherever they might be in the world. An atmosphere of collaboration and communication, the StandWithUs Conference not only allowed me to befriend like minded individuals, but also provided me with the opportunity to network, develop tools and strategies, and cultivate pre-existing strengths to allow for me to better share Israel’s story. It can be daunting to immerse oneself into an environment of unfamiliarity. What I now realize is that no matter what your prior association may be with Israel, all you need is the desire — to do, to change, and to defend. The story of Israel and its people is a narrative that only we have the power to define and to develop. Thanks to the incredibly powerful network of pro-Israel students on campuses nationwide and worldwide, we have the power to do just that. One thing I know for sure: if there is no Jewish homeland then there will be no safe haven for our people and those who Israel so staunchly protects. That is my Israel narrative and this is why I proudly stand up for Israel on my campus.